One of the great inventions of our time – the modern refrigerator – will get an efficiency makeover when new national efficiency standards go into effect on September 15, reducing energy use of most refrigerators and freezers by about 20-25%. The new standards take effect 100 years after the first modern refrigerators were mass-produced for general use. Before that time, consumers used iceboxes (literally boxes with ice) to keep their food cold, but food safety was an issue. When the ‘electric refrigerator’ was finally introduced it was more than just a convenience, it was an invention that saved people’s lives. (See this 1926 advertisement from the Electric League of Pittsburgh). 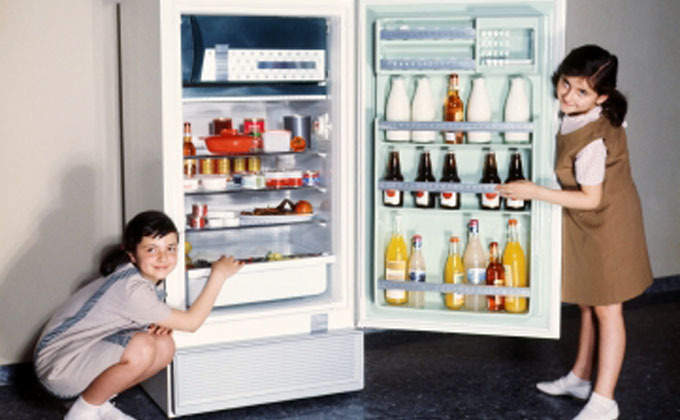 Refrigerators have evolved considerably since the 1900s both in appearance and function. The early units placed the cooling device on top of a small boxy unit while today’s sleeker multi-door units place the cooling units unseen on the bottom. The refrigerator story is filled with intriguing plot lines – from the initial energy crisis in the ‘70s, to negotiations between disparate groups of stakeholders, to national legislation signed by President Reagan in 1987. It’s a good story packed with positive outcomes. The graph below gives a birds-eye view of some of the changes over the last 40 years. While energy use decreased more than three-fourths, refrigerator volume increased, and price (in $2010) decreased by two-thirds. Energy crisis sparked change: The energy crisis in the 1970s marked the beginning of the end for energy-wasting refrigerators. Between 1947 and 1974, average energy use of refrigerators had shot up from less than 400 kilowatt hours (kWh) per year to more than 1800 kWh per year, earning it the title of the “most energy-thirsty appliance in the family home.” When the energy crisis struck, California responded by passing forward-looking legislation. In 1976, the newly formed California Energy Commission (CEC) set the first-ever efficiency standards for refrigerators, requiring all units sold in the state to meet maximum energy usage levels. The CEC updated the refrigerator standards two times in the ‘80s. These standards, along with technological advances (blown-in foam insulation for one), reduced refrigerator energy use from its 1970s peak. Early standards led to collaboration among stakeholders: Eyeing California’s success, other states, including Massachusetts and New York, adopted state standards. Manufacturers, wary of a patchwork of state standards, worked with efficiency advocates and consumer groups to come up with consensus standards that were eventually included in national legislation, adopted by Congress, and signed by President Reagan in 1987. Since that time, DOE has updated the national refrigerator standards three times. The collaboration between stakeholders continues—the standards taking effect this month are based on a joint recommendation that manufacturers and efficiency advocates submitted to DOE in 2010. Standards spurred innovation: As several rounds of state standards and three rounds of national standards were adopted over the 40-year period, manufacturers met the efficiency levels with innovations and technological advances. To meet the newest efficiency levels, manufacturers will likely use additional insulation improvements, higher efficiency compressors, improved heat exchange in the evaporator and condenser, and more efficient fan motors. As quality, efficiency, and number of features went up, the price went down: Along with the efficiency upgrades, manufacturers have maintained or improved performance and added many new features. An April 2014 Consumer Reports article called “ The Refrigerator Features You Can’t Live Without ” says, “We’re seeing more refrigerators that are excellent at maintaining consistent temperatures and saving energy.” The article also notes that the “future is in features” with such items as door-in-door compartments, pull-out drawers for deli meats and cheese, high-capacity ice makers, and even sparkling water dispensers. 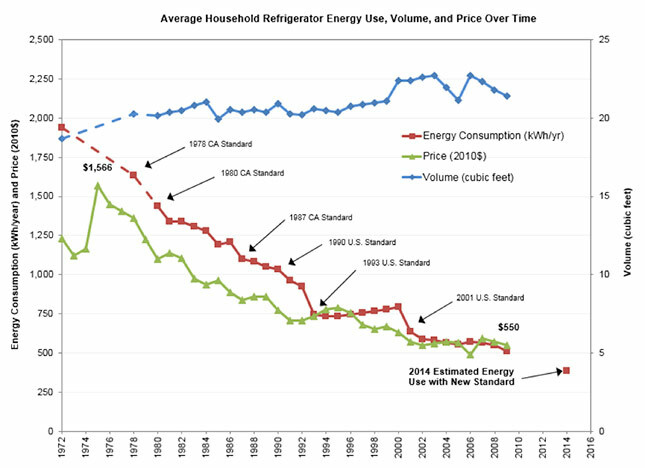 A 2012 ACEEE/ASAP report, Better Appliances: An Analysis of Performance, Features, and Price as Efficiency Has Improved, found that as standards were implemented, temperature performance improved, new features were added, annual energy use declined by 50%, and refrigerator price decreased by 35% between 1987 and 2010. Consumers wanting to save even more than what is achieved by the new standards can select refrigerators bearing the ENERGY STAR® label to save another 10% or more. Buyers can consult the yellow Energy Guide labels affixed to products for an estimate of average product energy use. The efficiency story does not end here. Energy savings from more efficient refrigerators will continue to grow as consumers replace their old inefficient products. DOE estimates that the new efficiency standards will save nearly 5 quads of energy over 30 years, or enough to meet the total energy needs of one-fourth of all the homes in the United States for a year. DOE also estimates CO2 emissions will be cut by 344 million metric tons over 30 years, an amount equal to the annual emissions of about 70 million cars. Over the same 30-year period, and taking into account up-front costs, consumers will save up to $36 billion. The electric refrigerator has come a long way from its high-priced, energy wasting ancestors, thanks to cooperation between manufacturers, advocates, and government. Now that’s a story worth telling!